Procumbent to decumbent, short-lived perennial subshrubs. Leaves heteroblastic; lamina green or greyish-green, trilobate to bipinnatisect or trifoliolate. Pseudo-umbels with 1-6 flowers each. Flowers extremely zygomorphic, protogynous. Pedicel 1-3 mm long, Hypanthium 4-55 mm long, Sepals with prominantly raised brownish or reddish veins. Petals 4 or 5. Fertile stamens 5 or 7. Chromosomes 2n = 22 (caucalifolium: 44). See S. Afr. J. Bot. 52 (1986) 438-462 for details. anemonifolium Jacq. syn. myrrhifolium (L.) L'Herit. athamanthoides L'Herit. syn. (?) myrrhifolium (L.) L'Herit. var. coriandrifolium (L.) Harv. 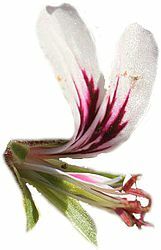 coriandrifolium (L.) Jacq. syn. myrrhifolium (L.) L'Herit. ecklonii Turcz. syn. myrrhifolium (L.) L'Herit. var. coriandrifolium (L.) Harv. emarginatum P. E. Moench. syn. longicaule Jacq. lacerum Jacq. syn. myrrhifolium (L.) L'Herit. meifolium Meissn. syn. (?) myrrhifolium (L.) L'Herit. var. coriandrifolium (L.) Harv. pendulum G. Don syn. longicaule Jacq. rogersii S. Moore syn. candicans Spreng. triangulare (Eckl. & Zeyh.) Steud. syn. multicaule Jacq.